Animation is usually broken down into scenes which may represent different times in the story or you might want to film an animation from different points of view. In a single maya scene file you may need to animate the camera and/or jump to a different view-point and animate some more. If you use a single camera then this is relatively easy to do by adding keyframes to the camera but it can quickly become messy if you need to make timing changes. The problem is that you really have two types of keyframes - the ones that create the camera move and the ones that are doing the camera cuts. Some of your shots may need the camera to be part of an animated heirarchy - parented to a moving car, for example - while in the next shot the camera is stationary - a view ofÂ the car driving by. 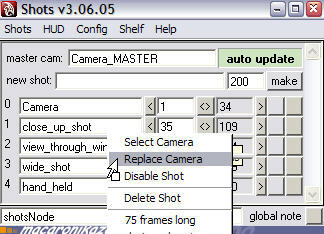 If you use multiple cameras you can set up a camera for one move and another camera for the next. Keeping each move independant makes it much easier to make timing changes but now the problem is that it is hard to visualize how the cameras work when they are cut together into a sequence. In this walk-through I will show how to use zooShots to establish a camera management system within your maya scene file. You will use the zooShots User Interface to create a master camera that is linked to several shot cameras. 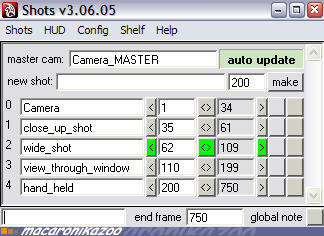 You animate the shot cameras and the master camera copies the shot animation based on the list of frame numbers specified in the zooShots UI. 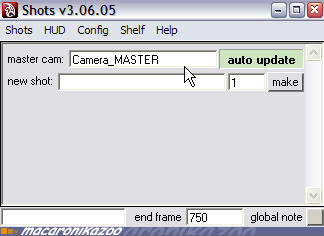 This creates a camera called Camera_MASTER. 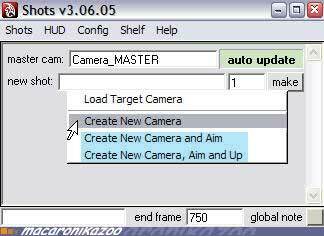 You can change the name if you wish by editing it in the zooShots UI. I'm leaving it as it is for now. 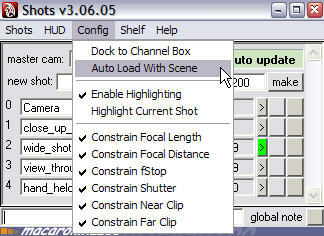 Create a shot camera by right-clicking in the new shot box and choosing Create New Camera from the menu. NOTE: The items highlighted in blue require that you have the special djx version of zooShots, which you can download here. 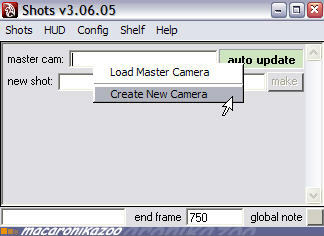 This creates a new camera called Camera, which you can rename if you wish. Next, click the make button to build the connections between the master camera and the shot camera. 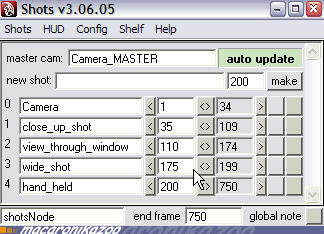 The UI now shows a single line in the lower section containing the camera name and the shot start and end frame numbers. 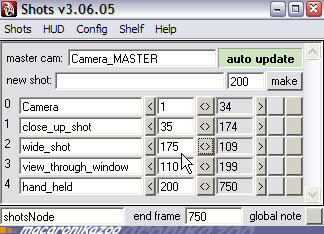 The end frame number, 750,Â is the number I have specified as the end of the maya timeline. 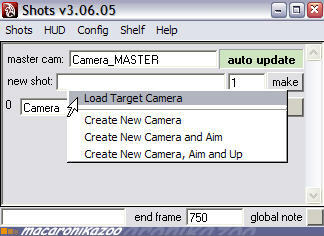 Make some more cameras by repeating the last steps or you could load an existing camera by selecting it in the outliner or hypergraph and choosing Load Target Camera from the new shot menu. I click make and anotherÂ shot is listed below the first. Notice how shot:0 now has the range 1 to 34 and shot:1 has the range 35 to 750. I added several more shots and renamed them to be meaningful within my scene. Notice how shot:2 in the shot list has green buttons surrounding the frame range, while the other shots are grey. This indicates that timeline current frame number is some where in that range. The [<],[<>] and [>] buttons allow you to set the playback range in the maya timeline. 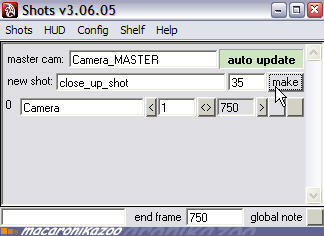 In this example clicking shot:1 [<] button sets the start playback to 35. Clicking shot:3 [<>] sets the start playback to 110 and the end playback to 199. 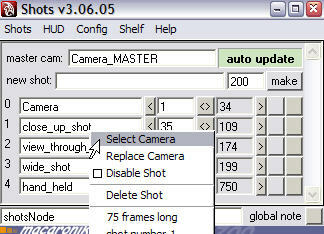 If you need to reorder the shots then enter a new start frame for your shot in the shot list. Here I change shot:2 start from 62 to 175. 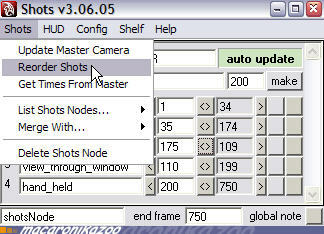 Then from the Shots menu choose Reorder Shots to update the shot list. As you can see, wide_shot has been moved to shot:3. The keyframes on the camera animation have not changed though. NOTE: zooShots only manages the camera cuts. In the example just shown, if there was a camera move on view_through_window or wide_shot you would still need to move the associated keyframes to work with the tining of the camera cuts. Well thats the basic workflow, but it is not the end of the story. zooShots has a lot of other functions built into it that you should explore and discover. 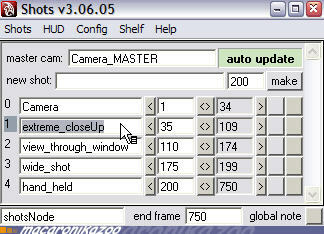 For example if you right-click on the camera names in the shot list you will get a drop-down menu. 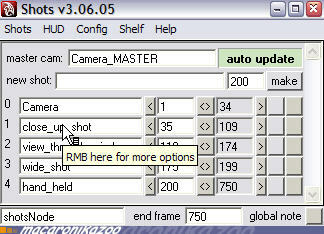 With this menu you can select the camera. Or, if you first select a new camera in the outliner or hypergraph, you can replace the camera in the shots list with your selected camera. This is a really nice feature. It means that you can try out different camera angles for a particular shot without losing the existing camera. In this way you can quickly switch between the alternate cameras. Here I replaced my close_up_shot camera with extreme_closeUp camera. If the director doesnt like the change, it is easy for me to switch back because I still have the old camera in the scene. 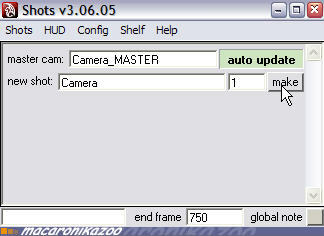 In the Config menu you can specify which camera parameters are managed by zooShots. You can turn off the shot highlighting feature (you may find it slows down your display if you have a very large number of cameras in the scene). If you turn on AutoLoad With Scene then the zooShots UI will be opened automatically when you load a scene that is using it.